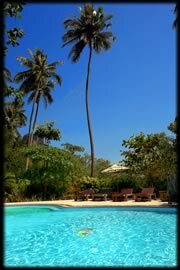 Railay Sunrise Tropical Villas offer luxury class accommodation in a tropical setting. 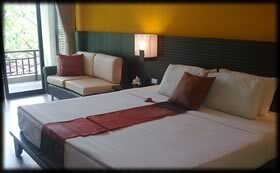 A minutes walk to Railay West beach, or five minutes walk to Phra Nang Beach. An unforgettable location on white sand beaches, lapped by the warm Andaman sea, nestled amongst towering limestone cliffs and coconut palms. Railey Beach's Sunrise Tropical Resort's pool and restaurant. This is probably my personal favorite place to stay in Railay at the moment. 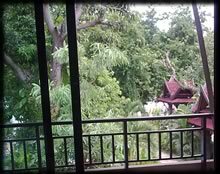 The gardens are fantastic, the bungalows generously spaced and positioned, the atmosphere is relaxing and the service is excellent. The rooms themselves although constructed some time ago, are so well made thought out and maintained, that they are a joy to stay in. (For more eulogizing check out the accommodation review page). These rooms are Sunrise's newest, being completed in November 2008. The rooms are in a two story complex which overlooks the pool. The rooms themselves are nice, well finished and well presented. The name is a little confusing, as these bare no relation to an European chalet, but are standard western style hotel rooms in a block. 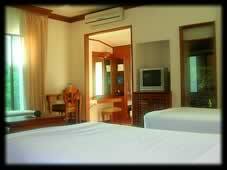 These rooms are good value for money, but do not really compare to the Tropical Villas. 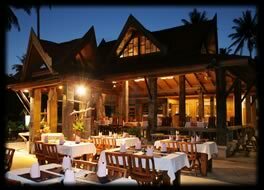 The Tropical Villas are single story Thai style structures based on a theme of simple elegance and utility. They consist of a bedroom with twin or king sized beds, an adjoining bathroom and a private balcony/patio. There are 3 pairs of connecting villas, featuring one bedroom containing a king sized bed, with a connecting door to a bedroom with 2 single beds. Large family's may find it convenient to book both these rooms together. These villas are private, contain a bedroom with a king sized bed, an adjoining bathroom and patio. 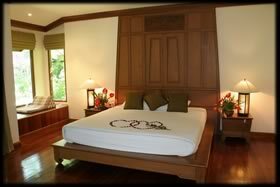 The Tropical Plus Villas are very nice- perhaps one of the nicest rooms in Railay. They are private stand alone villas nestled amongst the lush gardens. Inside they are beautifully finished, designed for practical comfort and easy living. 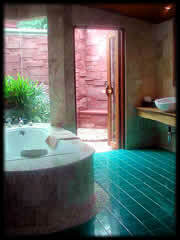 They have an oversized bathroom with an extremely comfortable bath tub and private nature orientated outdoor shower. There is a covered deck in the front. Our twenty eight Villas are surrounded by tropical gardens, featuring lotus ponds, coconut and areca nut palms, ferns, small foot bridges, tropical flowers and succulents. Each Villa has a spacious bedroom, luxuriously finished to to our high standards. A small patio in front of each Villa offers a pleasant area for an evening chat or a morning tea. International restaurant, serving the most delicious food from around the world. All of our Villas are air conditioned, have a king sized bed or twin beds, European style furniture, satellite television, mini bar, safe, phone, hot water, hair dryer and kettle for tea and coffee. All of our Villas have a Room service menu available for our guests who wish to dine in. Prices include a full buffet breakfast. Transfers from Krabi airport to Railay Beach are available for 1500 Baht each way for a mini bus which holds up to 8 people. Transfers are also available from Phuket airport to Railay beach for 3500 Baht each way for a mini bus which holds up to 8 people. After 6:00pm there is an extra 200 Baht charge per transfer. 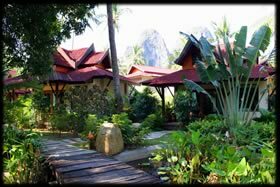 Our bungalows are located on the east side of the thin strip of land which makes up the Railay peninsula. All of our bungalows are no more than a minutes walk from the beach. To book a stay in our bungalows please fill out the booking form below. It is a good idea to book several months in advance during high season as we do get very full. Once we have received your booking we will email you confirmation of the rooms availability. The email will contain a link to our secure credit card payment gateway. You will then have the choice of paying a deposit on your booking with either a VISA or a MasterCard. Our credit card gateway is implemented with 128 bit encryption in conjunction with the Bank of Asia. If after you have paid your booking, you wish to cancel, then you may do so up to a month before arrival with a cancellation fee of 10% of the total accommodation cost. Peak season bookings require 2 months notice. High season bookings require 1 months notice. Low season bookings only require two weeks cancellation notice. If you do not cancel within the required time limit we may be unable to provide you with a refund. There are no refunds during high and peak season for customers who chose to check out early, unless 2 months notice is given of a change in booking. Refunds are provided for natural disasters. If a natural disaster occurs and your cancellation notice has expired, we will provide a refund of 75% of the booking, or reschedule your booking (depending on customer preference). Natural disasters are limited to Tsunamis, earthquakes, volcanoes, comet strikes and the end of the world.